On April 5, 1242, Russian forces from the Republic of Novgorod repelled Catholic crusaders in the Battle of the Ice, fought on frozen Lake Peipus. 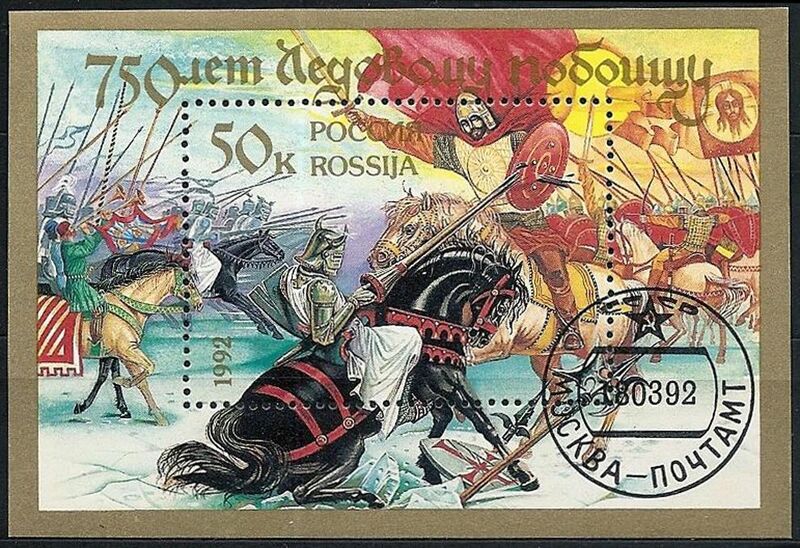 On April 5, 1242, Russian forces defeated western crusaders in the Battle of the Ice. The Battle of the Ice was fought on frozen Lake Peipus, and the political and cultural borders established by the conflict remain to this day. In the Battle of the Ice, the Teutonic Knights, a Catholic group, attempted to invade Russia and convert the Eastern Orthodox population of the Republic of Novgorod. This military campaign was part of the so-called Northern Crusades. Teutonic Knights involved in the Battle of the Ice were mostly Estonian, German, and Danish. Russians, led by legendary figure Alexander Nevsky, repelled the invaders. Today, Lake Peipus still forms the central border between Russia and Estonia. Russia remains overwhelmingly Eastern Orthodox and Estonia remains Catholic and Protestant. Some casualties of the Battle of the Ice may have fallen victim not to Russians, but to Lake Peipus itself. Pushed to the western shores of the lake, the thin ice broke and many of these medieval knights drowned under the weight of their heavy armor. It's a great story, but many historians think that part was invented by Russian filmmaker Sergei Eisenstein for his groundbreaking (icebreaking!) 1938 film Alexander Nevsky. to change or to be changed. (1100s to 1300s) military campaigns waged by Christian kings of Germany and Scandinavia in the pagan and Eastern Orthodox lands surrounding the Baltic Sea. Sometimes called the Baltic Crusades.